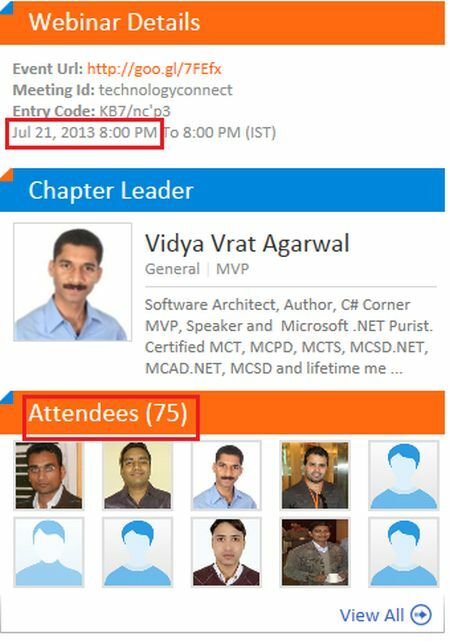 C# Corner Mumbai Chapter Webinar July 21st 2013 Official Recap. C# Corner Mumbai chapter offered a webinar (C# 5.0 Asynchronous Programming) on July 21st 8pm IST. After announcement of the event we received a total of 75 registrations. The Webinar started July 21st 8pm IST and a total of 65 candidates joined the webinar. I thank each attendee for making the webinar a great success. We had some attendees from outside Mumbai as well. I also would like to thank ShivPrasad Koirala and Kamal Rawat for their help right from the initial announcement until the final execution of the webinar.